Until recently, if you wanted semi-authentic ramen in Oklahoma City, you had two options: Twitter-stalk a food truck and hope you got lucky, or shell out 50 cents at Super Cao Nguyen for a sad approximation. It’s little wonder that when Tamashii Ramen opened near Midtown, even without a sign for weeks, word spread quickly. The whole experience had a thrill of the forbidden: small, anonymous and dark enough inside to hide the broth stains you’ll inevitably earn during your visit. 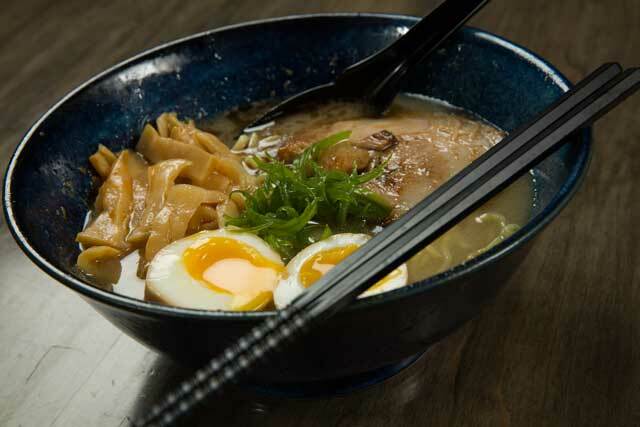 House hits include the tonkotsu ramen – savory, thick broth with fork-tender pork belly and a soft-boiled egg – and the spicy ramen with ground pork and jalapeno. Vegetarian options like the miso butter corn ramen are no less hearty, and the fresh noodles are worth an upgrade for larger portions. For those who aren’t in the mood for ramen, we don’t understand you, but there are other options like the garlic fried rice or crispy-soft octopus dumplings. If you think toast for dessert sounds strange, you’re right. The Fuji toast, an entire loaf of crumbly white bread drizzled with honey and paired with your choice of ice cream, is weird in the most wonderful of ways. No one who’s visited Tamashii will ever go Maruchan again. Tamashii Ramen is located at 321 N.W. 8th St. in Oklahoma City.